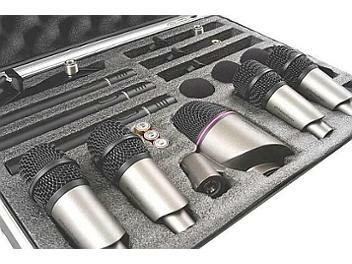 Globalmediapro MDS-8KT: 8 mic, 18 Piece Professional Drum Kit Microphone Set. Great performance at a realistic price. 8 mics, 4 tom & snare clamps, 3 mic stand clamps and 3 windscreens. The kit is designed for stage and studio recording of drum and percussion instruments. 1 x MDD-K200 wide frequency response dynamic uni-directional kick drum microphone, specially designed for kick drums and low frequency musical instruments. 4 x MDD-ST310 wide frequency response dynamic uni-directional snare/Tom dynamic microphones. 3 x MDC-OH100 cardioid condenser microphones suitable for orchestral instruments, cymbals etc. Ideal for overhead drum kit micing of of cymbals. Although I have only used the whole set a couple of times, I have found that the mics have many other uses than just micing up a full drum set. The 4 MDD-ST310 Tom & Snare mics are also worth trying on other instruments including guitar amps. The drum mounts for these also come in very handy too. I have has mine for a few years now, and one of these 4 mics died early on, but I forgot about it as I almost never use all 4 on one kit at one time, so I only remembered when I tried to use all 4 the other day. But at this price you can afford to get another set and just for the condensers alone this would be a worthwhile investment. The MDD-K200 Kick mic can also be used on a bass amp to quite good effect. And for a really good kick sound, try placing a Globalmediapro MC-19PA boundary condenser microphone inside the kick drum on a pillow or foam, near the front skin (with the bass roll-off switch) to get a nice tight click sound from the beater and then mix this in with the boom from the MDD-K200. The 3 x MDC-OH100 cardioid condenser microphones are the best mic I have ever used in that they are a pretty good overhead mic for drums, a really good choral mic that can be used well in stage productions and a real versatile instrument mic. I would love to try this on strings! One of the features I love about this mic is that it can use both a AA battery & Phantom power. This is a feature often found on shotgun mics but few others. This lends itself very well to use with wireless packs making it a perfect stage mic. With a custom adaptor cable, a wireless body pack of a lapel mic can be attached to the stand and moved freely about the stage with no cable clutter. I have found this use to be very good with stage plays where drama / singing require mics onstage, but dance performances require the mics to be cleared away as there is no cable clutter to trip over or be distracting. I found that a fast setup option of one overhead and the kick mic also works really well, especially outdoors where there is wind noise to consider and a whole drum mic kit picks up wind really well, so chopping it down to just 2 mics helps get round this while also being quick and effective. At this price, you can afford to really think outside the box and experiment with these mics. down the wire which come out of speakers somewhere down the line.